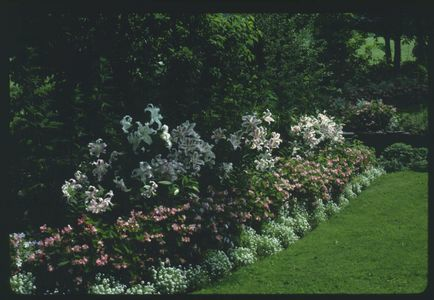 Photo by Wendy Bridgewater showing Oriental Lilies planted in afternoon shade between lawn and wood. If your lily bulbs are not planted in an open garden, they need to be located where they can receive either six hours of full sun or bright indirect light for most of the day. If plants lean more than you wish, gently loop a soft material around the stem and tie to a three foot stake or use one of the convenient, "invisible" supports offered in garden stores for peonies.